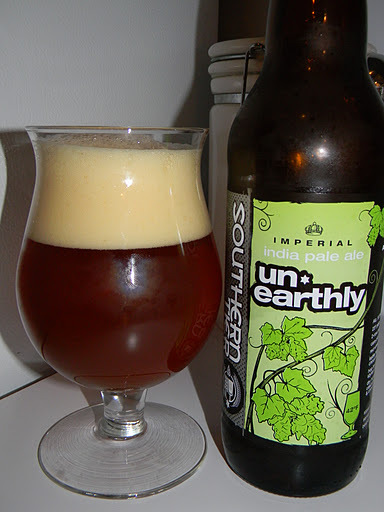 Review of Southern Tier Un*earthly | Beer Apprentice - Craft Beer News, Reviews, Interviews and Info. Hi guys. For today’s craft beer review I’m going to be trying a Southern Tier Un*earthly produced by the Southern Tier Brewing Company located in Lakewood, New York. Let’s just skip all of the small talk and jump right into the commercial description of this beer, which I found on the website, southerntierbrewing.com. This Imperial India Pale Ale has an ABV of 9.5% and it comes in a 22 oz. bomber. The beer poured a semi-hazy, orange to amber color. The cap was of very good size, off white in color, very smooth and mostly creamy. It had a mixture of both large and small, compact bubbles. The retention time was very good and the lacing looked very nice. The aroma was a beautiful mixture of grapefruit, pineapple, a touch of orange and other assorted tropical fruits. It had a slight sugary “cotton candy” fragrance that I absolutely loved. It was also very bright and floral with piny notes billowing off the top of the liquid. Sweet caramel malts added even more candied goodness. As the brew warmed, some of that sweetness was restrained by a toasted biscuit smell that I thought totally set this thing off. This beer had a spectacular aroma in my opinion. The taste seemed very, very sweet. To the point of being cloying. Tons of caramel malt combined with the enormous amounts grapefruit and pineapple citrus really made for a wary experience in the beginning. Heaps of bitterness sent the taste buds reeling. It began with way too much for me at first, but as the brew came into being it became much more manageable and harmonized. Some breadiness and toasted biscuit savors really helped dial this thing down. It needed it I thought. As I dove into the taste a bit more I started to recognize the piny hops as well as a light tone of alcohol. Lots of flavor with this one. The mouthfeel was medium bodied. Very dry, smooth, snappy, bright and crisp. A little bit of warmth was left behind from the alcohol and the palate was doused with enough flavor to make most any craft beer fan happy. Overall, after the beer opened up and I was able to comprehend what I was experiencing, I really started to like this beer. The appearance was great and the aroma was “world class” I thought. The taste shocked me at first, but once I settled in, I began to appreciate all of the bitterness and sweetness. If you like big, hoppy, sweet beers….. give this one a try. I don’t think you will be disappointed. The drinkability was a little lower than what I had anticipated however. I found it to be a sipper. I didn’t rush my way through it by any means. Like I said before, I really liked this brew and would try it again if it was offered. It’s not quite the best Imperial IPA I’ve had thus far, although it’s still pretty darn tasty that’s for sure. Thanks for reading and commenting folks. I hope you guys are still enjoying the reviews. I would love to hear some feedback regarding the blog. I appreciate the interaction.